Len, A Lawyer in History: A Graphic Biography of Radical Attorney Leonard Weinglass [AK Press; $19] is exactly what its exceedingly long title says it is. It’s a riveting account of the life of one of the most selfless lawyers of them all, a lawyer who tirelessly devoted himself to the defense of liberal and radical clients, men and women who rarely had the means to pay him the kind of fees he could have gotten working for establishment law firms. Simply put, Weinglass was a hero. 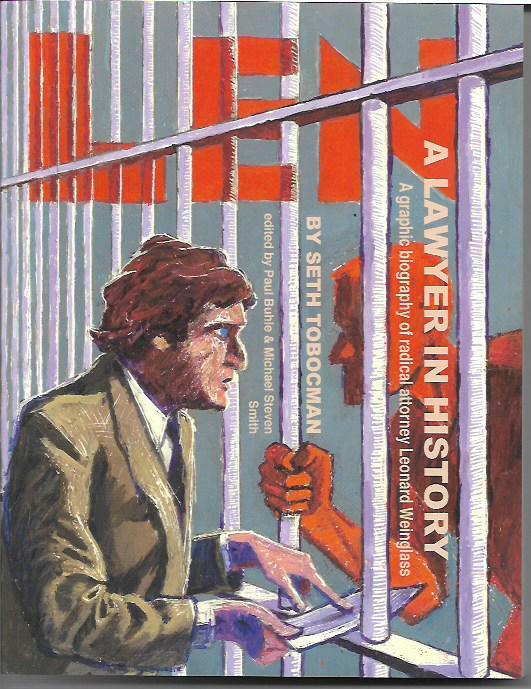 This graphic biography is written and illustrated by Seth Tobocman, who has often devoted his talents to the same kinds of causes that Weinglass championed. Among his other accomplishments, Tobocman is a founder and regular contributor to World War 3 Illustrated. The magazine regularly address vital social issues in comics art form. It’s a favorite magazine of mine, one which demands my concentrated attention and thoughtful reflection. Getting back to Weinglass, he was a constitutional law advocate who served as a captain judge advocate in the Air Force. Successfully defending a black soldier in a court martial trial did not win him accolades from his superior officers. I’m sure they were even more horrified by the clients he served when he return to civilian life and private practice. They included the Chicago 7, Pentagon Papers whistler blower Daniel Ellsberg, Angela Davis, Kathy Boudin, Abbie Hoffman, Mumia Abu-Jamal and, at the time of his death, the Cuban Five. I’m guessing few of my younger readers recognize any of those names…and that only a few more of my older readers recognize most of them. Their stories are worth studying. Tobocman makes Weinglass come alive in this graphic biography. The book is divided into easy-to-digest chapters that allow the reader to consider and perhaps do their own research into these matters. “Their Second Chance,” Weinglass’ defense of and interactions with native American convict Jimi Simmons and activist Karen Rudolph, is the kind of story that should be on the big screen. It’s moving and unforgettable. Len, A Lawyer in History is my pick of the week. It’s not going to be of interest to all comics readers, but I think it’s a terrific example of how our art form can bring a clarity and power to real events. I recommend it to readers who like to be challenged and, of course, to public and school libraries. 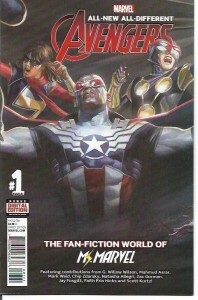 It may be too in-joke-oriented for comics readers who don’t explore every corner of online comics fandom, but I got a kick out of All-New, All-Different Avengers Annual #1 [$4.99] featuring “The Fan-Fiction World of Ms. Marvel.” That’s right. Ms. Marvel reads and even writes fan fiction about the heroes she works with on a nigh-daily basis. Ulp! Many years ago, I loved the fan fiction stories of my dear friend Dwight Decker. His fiction featured fans of his creation. I loved it so much I wrote a prose tale set in his universe and with myself in a lead role. It is one of the very few things I’ve written that embarrasses me. I’ve written things that weren’t very good – it’s part of the learning process – but that story, unlike the others, still makes me cringe. Ms. Marvel’s fan fiction is about the Marvel Universe in which she lives and battles for good. This annual reveals that fan fiction in a framing sequence by G. Willow Wilson and Mahmud Asrar and five short stories by Mark Waid and Chip Zdarsky, Natasha Allegri, Zac Gorman and Jay Fosgitt, Faith Erin Hicks and Scott Kurtz. It’s an interesting collection of tales. Because I don’t read fan fiction for a variety of reasons, I can’t speak to the accuracy of these stories. However, I was especially taken aback by Waid and Zdarsky’s “The Once and Future Marvel,” an anti-feminist adventure which sadly reflects the often-misogynist attitudes of those who rail against creators and stories supporting social equality and justice. Darkly humorous, the story must have been a difficult one for Waid and Zdarsky to do. The annual also has a cartoony She-Hulk tale, an anthropomorphic take on Marvel heroes, a wild “Squirrel Girl Vs. Ms, Marvel” match and a kind of sappy romance. I like this stuff because it stretches the super-hero envelope in a way that does not impact the ongoing universe. The clever conclusion of Wilson’s framing sequence made me laugh out loud. Points for that. This All-New, All-Different Avengers Annual is an intriguing change of pace. It’s worth checking out if you’re a Marvel hero devotee or a creator/reader of fan fiction about those heroes. I know I saw Betty Boop as a child growing up in Cleveland, Ohio. The morning and afternoon kid shows with hosts like the friendly, wise Captain Penny and the otherworldly Barnaby bought and showed cartoons by the bucket. I didn’t realized the squeaky-voiced Betty was supposed to be a Jazz Age flapper, but, in those days of black-and-white television and but three channels to choose from, a kid could be entertained by anything that moved across the screen in a lively gait. It was my introduction to animation, viewing cartoons created ten and even twenty years before my birth. 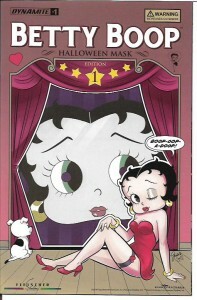 Dynamite’s Betty Boop #1 [$3.99] captures the spirit of those old cartoons and improves them. Roger Langridge’s “Enter the Lizard” is a sprightly and mildly subversive take on the Max Fleischer Studios toons wherein the devil himself seeks the soul of innocent Betty. The script includes spiffy musical numbers that make me wish the comic came with a soundtrack. They look like so much fun. The images and storytelling of artist Gisele Lagace are wonderful. Her drawings are animated. Her panel-to-panel flow is spot on and lively. Without distracting from the story, her work is so good it lingers in my mind from page to page. Betty Boop #1 is a great start to this new series. I don’t plan on missing an issue. It could just be the little kid in me, but I may be falling in love.